Our oral health is at risk every time we travel. In this short video, I offer strategies that can help you to protect your teeth and gums while you travel. Looking for a healthy sugar alternative for sweetening your beverages or for baking? Granular xylitol is the perfect solution! Granular xylitol has a low-glycemic index (7.0) and has 40% less calories and 75% fewer carbohydrates than sugar. Granular xylitol is also a simple and easy way to care for teeth, especially for those who can’t use xylitol mints or gum. In this short 3-minute video, Dr. Ellie explains why she loves granular xylitol for general health and more specifically for healthier teeth! We all know we need to brush our teeth to maintain our healthy pearly whites. But are you brushing properly for optimum gum health? In this quick 1-minute video, I explain how to maximize your daily brushing for ultimate gum health! In the 1950s people believed the world was about to change. World War II had concluded, antibiotics and other pharmacological wonders had arrived, and improvements in communication were about to bring a life of better health, world harmony and improved prosperity for everyone. Today, a generation later, we look at our senior population – our parents or grandparents – and see an epidemic of chronic diseases like diabetes, cardiovascular problems, dementia and Alzheimers. Many are experiencing a terrible ending to life: so what went wrong? This is a story about bad information. Our parents were told low-fat and sugarless products were healthy. Artificial chemicals tasting like the “real thing” were used in foods and drinks. So many people, like my parents, believed these products were better than butter or home-grown vegetables. They followed the advice and swallowed toxic substances in foods, drinks and over-the-counter potions, thinking they were miracles to loose weight and live a long life. For many reasons we must weigh advice from all sources. Today many doctors understand the value of natural food for health, and how the body can build it’s own defense system to fight illness and disease. Dentistry still lags in understanding nutrition for oral health and the value of unfilled, pristine teeth and sustainable oral health. Perhaps our biggest worry should be the link between mouth plaque and chronic disease. Remember oral health can be protected and improved with xylitol – and consider 2016 a New Year for your teeth and gums! Please give Zellie’s xylitol products and my Complete Mouth Care System an opportunity to empower you with the gift of healthier teeth – starting today! Everyone in the Zellie’s Team would like to wish you and our many supporters a Healthy and Happy New Year! Here is a link to our Zellie’s story and our Healthy Teeth Fund. Zellie’s established the Gift of Healthy Teeth fund in 2014 because we believe healthy teeth are a greatly under-appreciated gift. The number of adults wearing braces is growing, and Orthodontists say nearly half of all newly installed braces are for adults – not kids! Often adults want to improve their smile and the makers of braces – knowing this – are ramping up serious marketing to adults. Braces can definitely improve the look of a smile, and today braces are more convenient and may be helpful – but they can be costly ….and the major cost may be your gum health! Orhthodonists are trained to fit braces – and make no guarantee your teeth will be healthier at the end of treatment. They often have hygienists to help, but the truth is braces are a “risk factor’ for tooth decay and gum disease, and braces can have devastating outcomes for adults who have poor oral health at the start of treatment. Prevention is so much easier than correcting problems when they have occurred! I suggest anyone considering braces – child or adult – should spend 2- 8 months using Zellie’s and the Complete Mouth Care System before braces are fitted, and stick with the System through the treatment. This system is effective even without flossing. Anyone with braces knows flossing around wires and brackets is impossible. Given that September is “Dental Infection Control Month”, I’d like to comment on a study that determined eye wear and masks are ineffective for protecting dentists from infection during treatment. 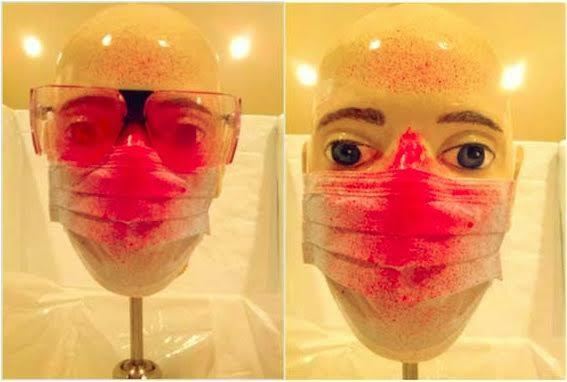 Red dye showed how splatter travels from a patient’s mouth to a simulated face, positioned where a dentist or hygienist would sit in the dental office. Dentists drill teeth at high speeds (180,000 rpm to 500,000 rpm) and this generates spray and debris that travels up to 50 mph – particles of filling, tooth, calculus, and harmful pathogenic germs from teeth, saliva and blood. The study, illustrating the inadequacy of dental masks, was funded by inventors of a special debris deflector offering improved protection. When I read this study, I ask the question, “what about the patient?”. Surely patients are at risk when lying horizontal with an open mouth, open nostrils, vulnerable eyes, and naked skin? What about debris floating in the air for hours after a patient leaves the office? What are the consequence for a child or adult who is next in line after someone with foul oral health? This seems an obvious concern, yet there is almost no other research. Perhaps we need “clean” rooms for examinations of children and those with healthy mouths. Don’t hold your breath waiting for this! 1. Schedule a dental appointment as early in the day and week as possible, ideally after a long weekend when the office air will have settled. 2. Avoid Friday afternoon appointments. 3. Boost your immune system with a healthy diet and probiotics for several weeks before an appointment. 4. Adults should use the Complete Mouth Care System immediately before an appointment. 5. Eat Zellie’s as you exit the dental office.